when I was about 8 years old I saw a commercial that changed my life. never has an advertisement company achieved its objective as perfectly as it did for me with pantene pro-v shampoo and conditioner (this is a big statement for a girl who only buys oatmeal from boxes with bob harper's face). 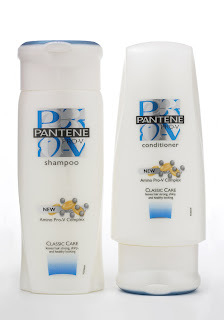 i begged my mother for weeks to buy "pantene pro-v, for hair so healthy it shines." finally the poor woman conceded and purchased it. that afternoon when she walked through the door from the store, i got my greedy hands on my treasure and headed straight for the shower. sitting in front of the mirror for the next few hours, i waited for my hair to transform from mousy and flat (and greasy?) into computer-animated perfection. 12 years later and against the advice of every hair stylist i've ever been to (yes, i ask every. single. one), I still use pantene pro-v. according to the experts, it coats the hair follicle in wax. contrary to the speculations of my younger, more idealistic self, there is absolutely no doubt in my mind as to whether or not this is true. it just doesn't make sense that hair stylists everywhere have a secret union with the objective of putting pantene pro-v out of business (um, yes. i used to have conspiracy theories. don't judge). i know they are making little girls think their hair can look barbie-commercial perfect and are coating my hair in grease, but guess what, hair school girls! i just don't care. i'm holding out for pantene pro-v. someday it will start working. mark my words. Oh, Dani. I love the way your hair glistens in the sun. I never even considered that the stylist's incessant disapproval of Pantene could all be a conspiracy. You are so wise. hm, its so true though-in every commercial they have the girl's hair looks absolutely perfect! I switch between PPV and John Freda and I really do like PPV. It makes my hair soft, but definitely not as shiny as the commercials.